RF front end, AF preamplifier, tone control and mute. Above — The block diagram of Part 2 Topics. Welcome to part 2 — the Funster receiver front end arose from my experiments with Chapter 9 of Experimental Methods in RF Design EMRFD. 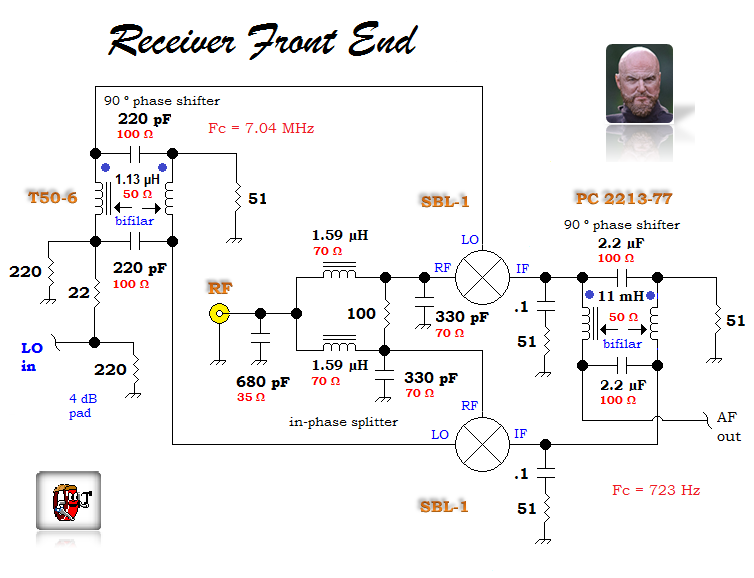 Above — All passive front end schematic. In EMRFD and his QST R2 and A Binaural I-Q Receiver articles, Rick, KK7B vividly wrote how to design in-phase splitters and RF quadrature hybrids, so I won't go into detail. My RF and AF quadrature hybrid center frequencies = 7.04 MHz and 723 Hertz respectively. To calculate the correct L and C values, crunch the familiar formula L = desired Ω / (6.28 x frequency in Hz). So for the 50 Ω RF quad hybrid inductor: 50 Ω / (6.28 x 7040000 Hz) = 1.13 µH. To calculate the companion capacitor value in pF: C = 1 / (6.28 x Frequency in MHz x desired Ω) C= 226 pF, but we normally substitute the nearest standard value: 220 pF. The audio phase shifter L C components are nearly the same raw values — but scaled up for AF. I ran 2 SBL-1 diode ring mixers (DRM). Some gasp at their price, but I bought them long ago for a song. It's now cheaper to buy surface mount DRMs, or perhaps you might home brew some? If you make your diode rings with SMD Schottky diodes, with any luck you'll find some with 2 diodes per chip, or even better — in a quad ring for strong matching. For example, last year I built a lovely VHF-UHF DRM with the quad HSMS-2827 part in SOT-143. 1N4148s can work okay for HF: most builders rummage through their collection and use the 4 that have the closest DC forward voltage drop. In keeping with the "20 dB or so" sideband suppression theme of this receiver, I omitted an AF diplexer which helps boost opposite sideband suppression by mitigating mixer output port mismatches. Instead, I just terminated the mixers at HF with the shunt 0.1 µF + 51 Ω R C network and the well matched input impedance of my AF preamplifier. Far from trivial, it took me 4 tries at winding pot core mH inductors to make a decent 11 mH AF quadrature hybrid. I put the bobbin over a vice-held pencil (with a thin layer of tape to hold the bobbin firmly) and wound 28 AWG wire from left to right then right to left (and so on) to make a tightly wound, even coil. I didn't measure, but probably have 487 cm of wire folded in half to make my bifilar coil. Above — Front end breadboard with a mistake in the 1st quadrature hybrid. After I photographed this board, I then realized that I didn't made the RF quadrature hybrid with a bifilar wound single toroid! Showing this photograph keeps me humble and besides, I don't have any others photos of the passive front end to show. This receiver front end shows but 1 method to make a DC receiver with 20 dB or so sideband suppression. Many readers wrote to tell me about other phasing methods such as the exciting Tayloe system — thanks guys! While I could find many examples of phasing rigs using CMOS switches/all-pass op-amps etc., this is the only rig I've seen based on EMRFD Chapter 9 experiments other than the R2 and binaural receiver also published in QST by Rick, KK7B. To clarify. My blog records the work of a lay-person as I bumble along trying to learn about radio electronics design. It's just 1 warts-and-all viewpoint and not a comprehensive guide to what's 'out there' by any means. I enjoy the many perspectives shared about radio topics and just offer my 2 cents worth. Above — AF preamplifier chain schematic with measures. With all of the receiver gain at AF, I sought a low noise preamplifier chain. After testing many designs, this 1 jumped out. The strong input return loss [25.6 dB] makes it suitable to follow any diode ring mixer product detector. Q1-Q3 realized my goals of swinging the biggest possible AC signal without adding much noise while obtaining a 50 Ω input impedance and a low output impedance. Q1 and Q2 form a shunt feedback pair that offers wide band AC and DC stability. Because the shunt feedback from the emitter of Q2 to the base of Q1 lowers Q1's input impedance greatly, I needed to add the 27 Ω resistor for emitter degeneration (series feedback) to bring the Q1 input impedance up to 50 Ω. I made the return loss measurement with my home brew 50 Ω AF return loss bridge documented in my old website archives. capacitor rolls off AF < 100 Hz or so. All the AF signal chain capacitors should be "polysomething" as possible. A 1 nF cap on the Q1 collector bypasses any higher frequency RF to ground. 5532 op-amps represent an amazing performance per cost ratio and 2 years ago, a retired EE from the Midwestern USA sent me 25, and so, I've been working on those parts for awhile. Thanks Scott! 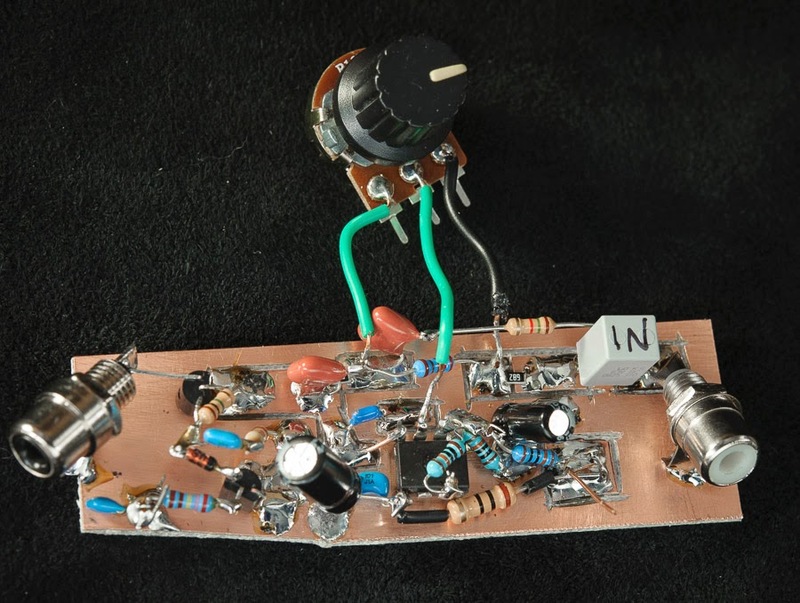 An op-amp splits the VCC and delivers the 1/2 VCC virtual ground via a 47K resistor. The 47K contributes nearly zero noise because the low output impedance of the first preamp is in shunt with it. The 47K decoupler R is required because without it, the near zero output resistance of the 1/2 VCC op-amp would hugely load the BJT preamp. 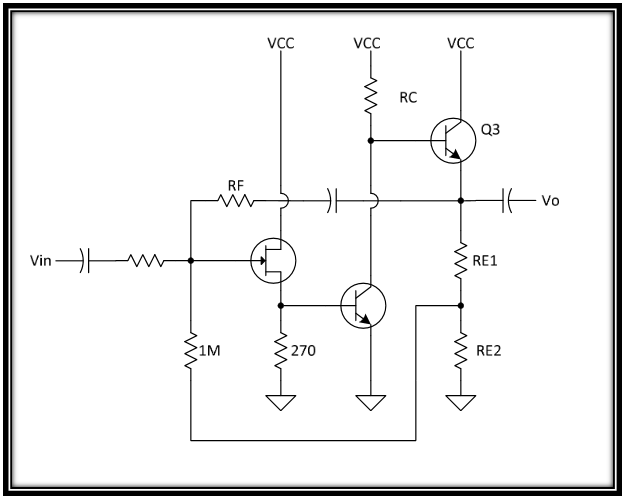 2 op-amps deliver gain plus low-pass filtration via 2nd order negative feedback filters. The impedance of the feedback circuit decreases as frequency increases, thus the closed-loop gain runs highest around the lowest frequency. With a 700 Hz cutoff frequency, clearly this receiver is set for CW reception. It's best to design your own filters and TI offers a great free program called FilterPro that I've enjoyed for years. I also experimented with some of the cap values: for example changing the 0.15 µF cap in the first op-amp to 0.22 µF will make the filter howl, Although the design called for 0.20 µF in that slot, I preferred 0.15 µF. Above — AF preamplifier breadboard on the front end board. I really had to cram the AF preamplifier guts on the copper board, however, this is the natural outcome of designing while you build. I also took the time to review op-amp theory. Op-amps are about as "black box" as it gets for us. Clear, well documented math guides their use and so it's possible to design with calculations or software and then actualize precise results on your bench! A few years ago, I built discrete component op-amps to learn more about them. While my designs suffered from questionable noise performance, the math worked and I felt vindicated. 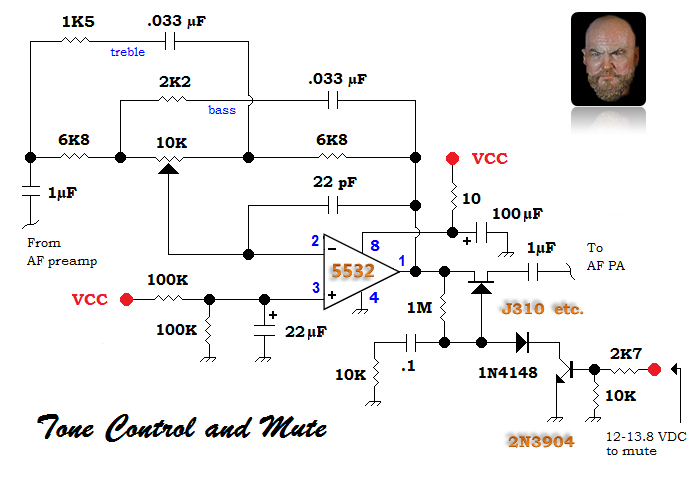 Ken Kuhn in "My Links" offers super op-amp tutorials, although many are high level. 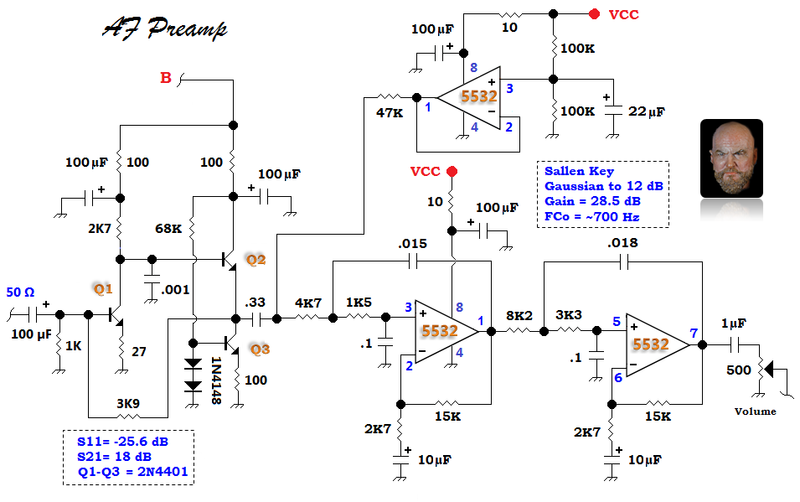 You'll find numerous other op-amp tutorials online. Above A discrete "op-amp" for experiments. For those inclined to go further, Ken Kuhn sent me this high gain JFET inverting amplifier for my discrete op-amp negative feedback experiments — the open loop gain ranges from many 10s to over 100. Set bias (RE1, RE2) so that voltage at emitter of Q3 is roughly 2/3 VCC. This circuit uses DC feedback for bias stability. All inverting amplifiers with an input resistor (RB) will generally suffer higher noise because of the noise voltage of RB. For high level circuits this is of little if any consequence. For low-level circuits it could be a major factor. Regardless, it's good for learning. 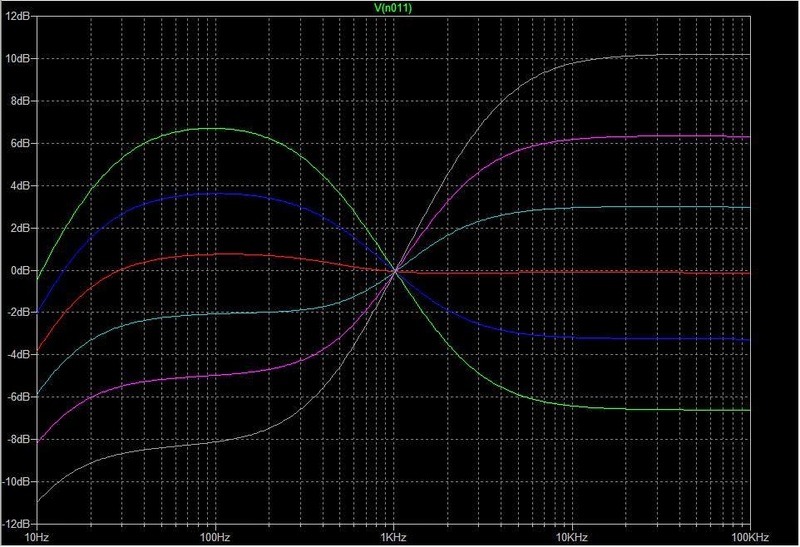 A 500 Ω volume pot controls the AF gain — from the datasheet, that's the maximum load we should apply to the 5532 output to maintain proper distortion performance. Following that, I ran a single knob tone balance circuit with a mute circuit cobbled to it. Above — Tone balance and mute schematics. 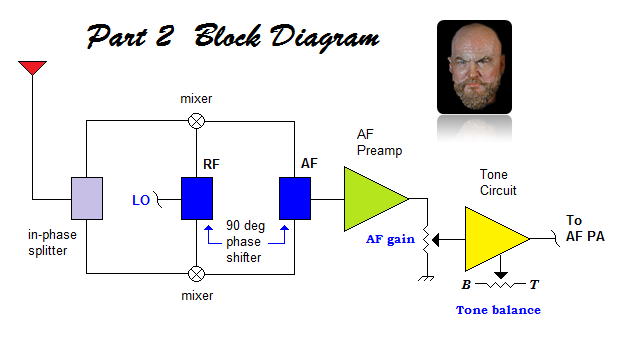 I show this tone circuit with permission of its designer, Douglas Self. 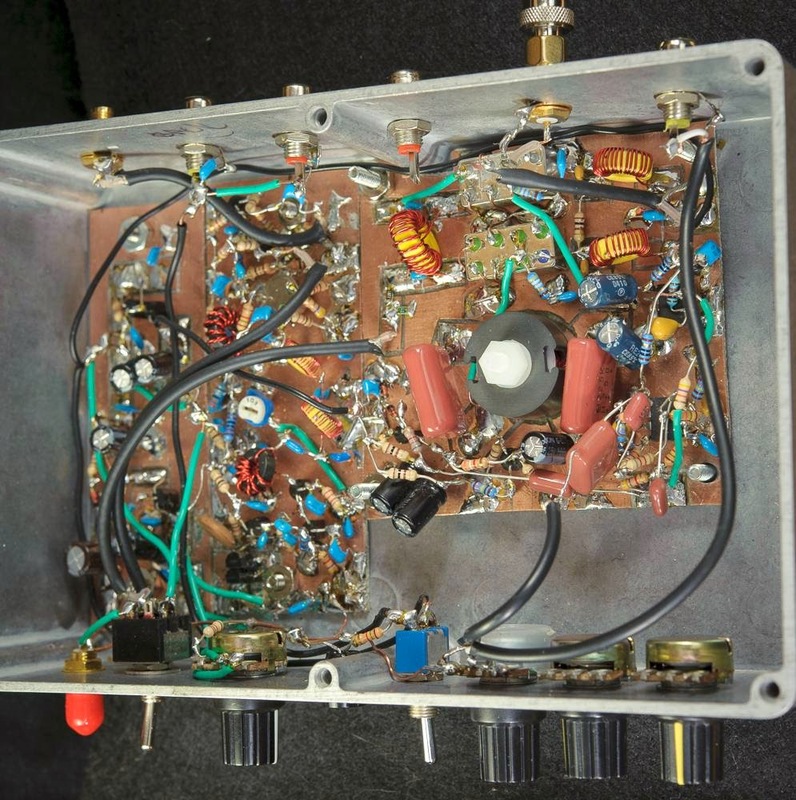 Amateur radio receiver manufactures fill their receivers with interference fighting tools and it's rare to see standard tone shaping circuitry. This also trickled into our home brew receiver practices. I'm not sure whether you'll like or want a tone circuit, but I do. At 1 end of my radio circuit chain lays an antenna and at the other, a speaker. Salty old radiophiles tell us it's best spend your hard earned money on your antenna system to boost performance; while learned audiophiles carefully choose and equalize their often expensive speakers. My speakers are also well chosen, cabinet mounted and I like tone control(s) to tweak the sound for whatever speaker and room (or tent) I'm listening in. The tone balance control came from an amazing book called Small Signal Audio Design: 2nd edition. Douglas Self, a recognized audio design authority writes beautiful, fun to read prose and his book ranks in my top 5 because it offers unassailable knowledge + inspires and teaches me how to write better. In short — insightful + actionable info for the DIY builder. My sincere thanks to Douglas for his work and for giving me permission to show this circuit. Above — Tone balance and mute circuit breadboard. I soldered in a temporary pot + input/output RCA lacks and tested the circuit before installing it. As mentioned in Part 1, I ran a temporary shielded cable from the 500 Ω pot output to an RCA jack on the back of my receiver. Thus I could easily test my tone and AF power amp circuits ex situ. 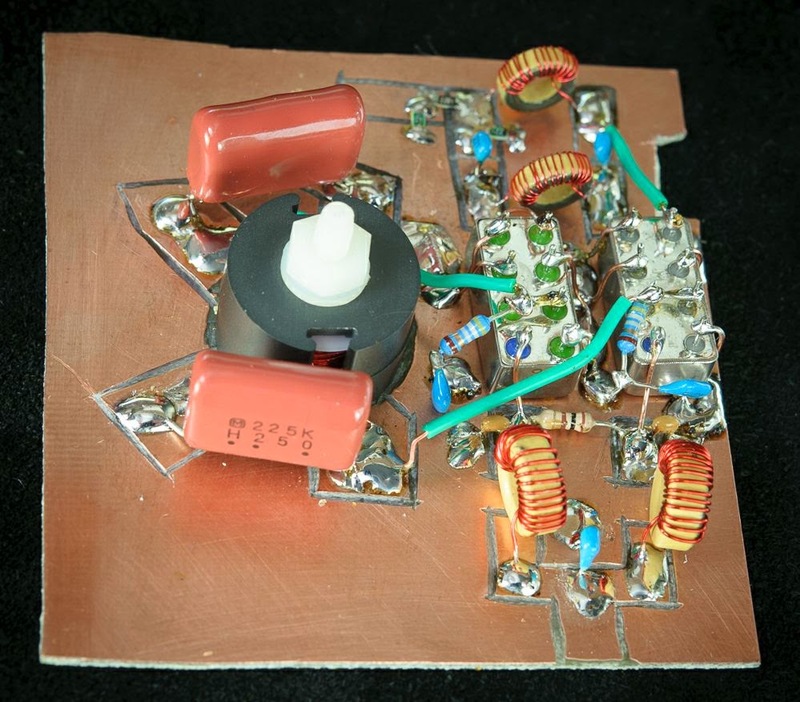 Above — A close up of the tone and mute circuitry. I carved 4 pads in the copper clad board: 1 for Pin 1. Another for Pin 2 + the wiper and then 2 more as solder points for the left and right potentiometer terminals. The 6K8 resistors were size 1206 SM parts. I changed 1 resistor from the original by D. Self: the 1K5 R was 2K2 in his book. Further, I converted it to single supply. A 100K resistor connects Pin 5 (+) and 6 (-) of the unused half of the 5532 to 1/2 VCC. Douglas Self adapted and modernized the tone balance control originally published in Wireless World for March 1970 by R. Ambler. This circuit often referred to as the Tilt or Ambler never really caught on mainstream, however a version got famous in the Quad 34 amplifier. As it boosts the bass, it cuts the treble and so forth. Although I tried a traditional bass/treble Baxandall design, the tone balance control won my favor in this receiver and happily it adds very little noise. Uncertain if I really liked it [was I just practicing gimmickry?] — I listened without it for 2 nights and then for 2 nights with the circuit inline. I preferred running the tone balance control because it adds a little sizzle back into my AF chain when listening in my radio room with my tuned, ported speaker. Your experiments may find otherwise. Thanks to Victor, 4Z4ME who plotted a transfer function with 20% steps of the 10K potentiometer. The mute circuit, my favorite, silently interrupts the signal path when the cathode of the 1N4148 diode gets short circuited to ground. A back panel switched 12v Funster line delivers 12 VDC when the companion Funster transmitter is keyed. Thus a 2N3904 switch grounds the 1N4148 diode to mute the preamp. Tests show that although a pull up resistor on the 2N3904 collector wouldn't hurt, it's not needed and works fine as shown. Douglas Self also shows some stellar AF mute circuits in his aforementioned book. In Part 3, I'll show the AF power stage + side tone, plus some odds and ends to wrap up the Funster presentation. Василий, добрый день! Наверно, можно писать по русски? Блог отлично оформлен и с полезными идеями. Дело в том, что хочу спроектировать приемник прямого преобразования 144 мгц на базе смесителя с выходами IQ, промежуточной 455кгц, дальнейшим сдвигом фазы на 90 градусов, суммированием и традиционной демодуляцией. С SDR не хочу связываться. Компактность нужна. Ясно, что фазовращатель придется пересчитать. Он мне нравится, симметричен схемно. Насколько будет успешен такой подход?